June 29, 2016 July 11, 2016 / J.K. This is my second review of an advanced copy, so that’s pretty cool. I received this about a month ago through NetGalley, but didn’t get a chance to read it until about two weeks ago. This book comes out next Tuesday. Go buy it, or pre-order it today. Right now, Amazon has it for less than $9. With all the good info you get at that price, it made me almost upgrade my rating. Level – short, easy. A quick read, but I’m also going to add compelling, especially as you read the personal stories. This is an important and timely book. I think two overarching themes of the refugee crisis often go overlooked. First, the authors make a great case (because they use the Bible) that we should accept refugees. If you are unaware, there are a great many verses related to refugees, strangers and foreigners. Most come from the OT, but, of course, the issue can be fairly easily summed up with – Love your neighbor. Second, the missionary opportunity. You have the opportunity to have people from all over the world, right in your neighborhood, or at least a short drive away. Even more inspiring, many of the refugees would like to go back home. There is no shortage of stories in this book about refugees who became Christians and then went back to spread the Gospel. However, the plurality of refugees are Christians fleeing religious persecution. This means so much of the fear is unfounded, and instead of viewing someone as a terrorist, it is more probable that they are a brother or sister in Christ, whom we should welcome. The book does a good job of taking the reader through the immigration and asylum processes. They explain who the people coming here are, and why they are coming. Too many complex issues in our society are dumbed down to simple talking points. The refugee crisis is far more complicated than Muslims=terrorist=ban refugees. Currently, I’m in a Bible study going through the book of James. James calls us to action. He requires we love others and act out our faith. He also says we should not make distinctions between people for things such as the way they dress or how much money they have. Even while discussing this, people in the group are voicing their support for banning Muslims. I empathize with the root of their fear. People want to protect their families and some have started to believe this is a dire threat. Unfortunately, that’s not what we are called to do. It wasn’t safe for the Good Samaritan to stop to help someone on the side of the road. It certainly wasn’t practical or discerning, but we are called to do the same. This refugee crisis is a major global issue, and it’s not going away quickly. As Christians, we must respond with love and compassion. Our response cannot be to turn them away. This book is a great read for anyone curious as to how Christians should respond. The authors do a great job in tying the issue to the Bible, explaining current geopolitical and economic issues and really personalizing this crisis. 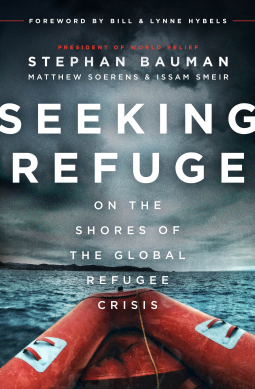 Anyone who is searching for good information about the refugee situation in the world today and our Christian response should put this book on their list of books to read next.